I feel like it's been ages since I updated but it's only been six weeks. I have so much going on these day that it's hard to keep up! On one hand, time seems to fly by, my little newborn nephew is almost 2 months old already. On the other I look back on things that happened a month ago and think... wow, it's only been a month? I have a new release this week, it's the fifth in the Shades series, Shades of Orange. 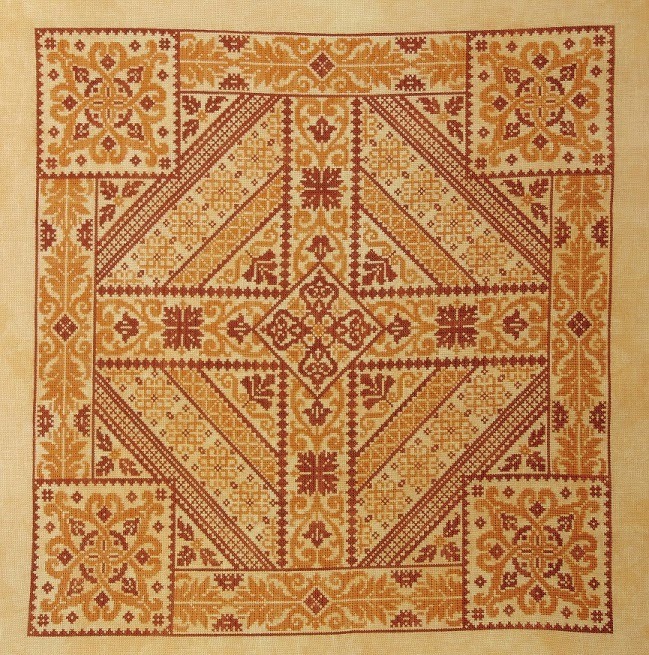 It's stitched on 40ct Honey Nut Linen from Sassy's Fabbys, and it uses 2 different colours of Classic Colorworks Silk floss (formerly Crescent Colours Belle Soie). The model was stitched by Nicola Maltby and it came out beautifully if I do say so myself, though I suppose I'm just a little biased. I'm not an orange person, but this may just win me over! It's in transit to Hoffman and has been sent off to Dinky Dyes as well for shop purchases. I've also added it to the Etsy shop for pdf purchase. I haven't been stitching a whole lot myself. 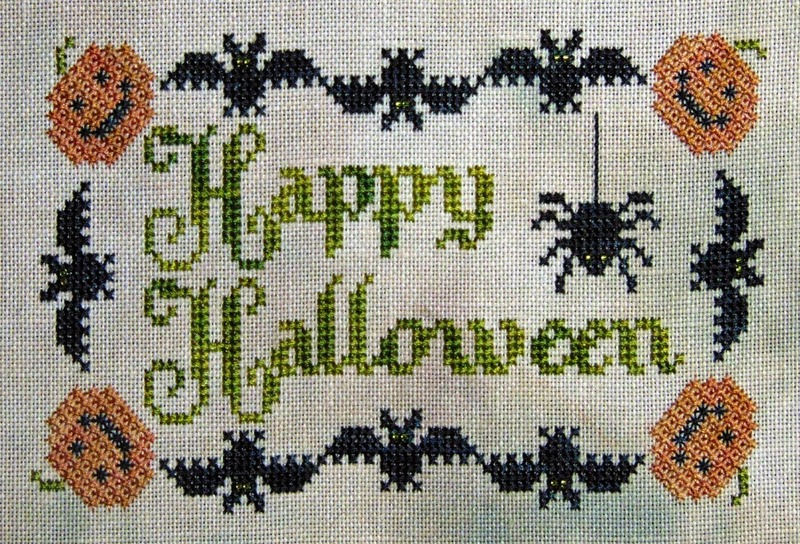 After finishing up Twisted Rainbow, I did up a Halloween Freebie for Pumpkin Seed Stitchers Facebook Group. I love Halloween, but I'm not really a Halloween stitcher. I admire all the pieces, they're really pretty and wonderful, but I just never really got into it. BUT, I had a lot of fun with this little piece. It's stitched on 32ct PTP Fresco (which is a little more pinkish than it shows in the picture), using Carrie's Creations Silks and Mill Hill Petite Seed Beads. I sent it along to my distributors as well to send out to shops with orders. The Facebook group is lots of fun, every month of the year there is a new Halloween freebie (this month was my month!). I will make it available to everyone at a later date, but for this month it's just for group members - please feel free to join us! There is also a group called Candy Cane Stitchers, and as you can imagine, each month is a different Christmas Freebie. I've got a design coming in that group as well. Apparently I forgot to take pictures before I put it away, as I'm 2/3 through the bottom half now too, but oh well. lol I'll show it off when it's done. This stocking has taught me several things. One, never, ever, ever again will I use aida. I hate it. I mean I replaced the cardboard like cheap fabric that came with the kit with slightly less cardboard like DMC aida, but it's not much of an improvement. I figured it was fully covered so why bother with nicer fabric. It's really terrible, that's why I should have bothered. No offense to the aida stitchers out there, it's totally me, I can't stand the stuff. I should have thought ahead and ordered some white lugana or jobelan with it, but I didn't and I'm regretting it. Two, never, ever, ever will I do another Dimensions kit. ICKY!!! Not only did I throw away the fabric, but the floss as well - at least most of the colours. There were a few I couldn't match up to DMC. It's horrible! 5 bloody strands? I'd rather do two strands and full cross stitches. If I'd been thinking at all, I would have. I did replace the a couple of the "unblended" reds, the green in the lettering and the white in the candy canes with Petite Silk Lame, and the whites in Santa's beard and coat with Wisper to give it a little more pizazz. Third, cotton floss and I do not mix. Even DMC. Perhaps it's the combination of cotton and aida, as I use DMC on linen occasionally and it doesn't seem to bother me nearly as much. If you've used silk and linen for any length of time you notice it glides through the fabric effortlessly - and quietly. Cotton floss and aida makes this grating sound that just irritates me. And because I'm using so many strands in the needle in places, I have to use a larger #24 needle and force it through the holes. Evenweave just has so much more give, the needle slides through the hole much more easily. With this I have to yank on it like crazy - it's possible that this has contributed to the arthritis issues with my hands as well. Call me an elitist. I know I am. I'm spoiled by years of silk and linen and once you're hooked it's hard to go back. All that said, it does look nice and will be a really cute stocking when it's done. Next week, if/when I get some time, I really need to update the WIP page and the finishes page here on the blog - I've been sent some absolutely wonderful pictures by stitchers and I have been terrible about trying to keep up with it. Also I would love some input from everyone. The Learning Sampler is soon coming to an end. We're working on part 14 at the moment, though everyone is at different points in their stitching, and the last part will be sent out in January. It has gone really well, and I've had several people ask if I'll be doing another stitch along when it finishes. I will be asking around before I decide for sure, but I have two different designs, Not Quite Whitework (which I've already started stitching) and Positive and Negative, which have layouts that would break down into parts easily. The first is predominantly specialty stitches - a lot of pulled work and textures, and the second is predominantly cross stitch and assisi stitching (which is still just cross stitch) and a couple of specialty stitches. I'm debating whether I'll make either or both into stitch along pieces and release them in their entirety after the SAL ends. Tentatively thinking that if I do, I will start Not Quite Whitework in March or April (giving me some time to get it stitched up ahead of time) and Positive and Negative in the late summer sometime. I'd love to hear your thoughts! If I don't do them as stitch alongs, I will of course release them in shops as per usual. And one last order of business... I'm finally getting around to having a website set up. My hubby is working on one for his boss right now, but will be starting mine when he finishes that. I will likely be moving my Etsy shop to a built in cart system, and this blog over to the website when it gets finished. I'll keep everyone updated on that as it progresses. I had been feeling like I haven't accomplished much of anything of late, but as I type this I realize I've been just as busy as always, just with things other than model stitching!! I would love to be involved in the Not Quite Whitework stitch along. I'm almost finished Celtic Snow and have just loved it.